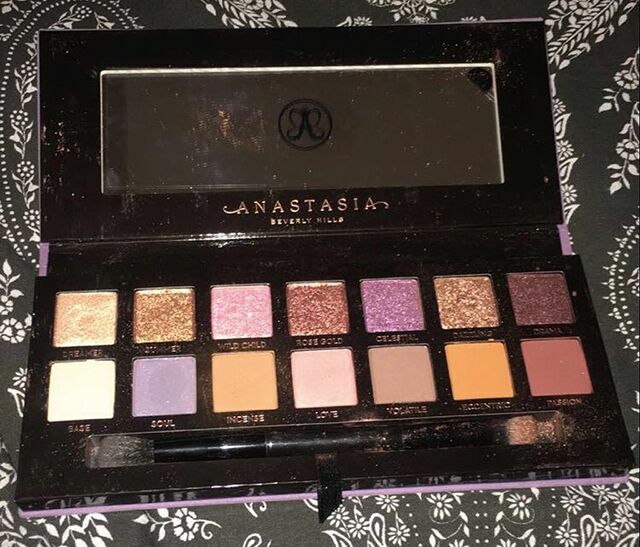 The Norvina eyeshadow palette is one of the latest products released by Anastasia Beverly Hills. It came out in July of this year and has gotten mixed reviews. Anastasia Beverly Hills is one of the most popular makeup brands, renowned for its brow products and contour kit. The new Norvina palette is the new talk of the town for beauty bloggers. It became the brand that everyone needs straight after Kim Kardashian featured it on her Instagram. The palette itself comes in a nice packaging with a purple velvet feel exterior and is nice and compact. It has a big mirror on the inside to see what you’re doing and it also comes with a two-sided brush. The palette costs around $42 which is around €36 which isn’t bad at all, considering the quality of the palette you are getting. It is named after the president of Anastasia Beverley Hills and is based on her favourite and most used shades. It has 14 shades altogether. These shades are broken up with one half being seven metallic shades and the other half consisting of seven matte shades. These shades work well together when blending and are very nice shades to use when going out or just for a day-to-day makeup look. The matte shades are quite warm and soft, a mixture of browns and a burnt orange shade with some lighter shades like pink and a pale purple. The metallic shades are made up of light and dark also with a ‘rose gold’ shade to a ‘wild child’ shade which is a light-toned pink. There is also a mixture of a light and dark purple in the metallic shades to give that darker feel to the matte colours. The brighter metallic shades compliment the matte shades nicely as they brighten them up and give that pop of glitter and shine. Always with these palettes, there are some downfalls. There is a lot of fallout with the matte colours. They are quite soft so there is a lot of excess on the brush and the actual palette itself. It can be a bit messy but this is a con with a lot of palettes that is easily fixable by just cleaning the palette. The brush that comes with the palette wouldn’t be the best to use. The bristles aren’t that good and it doesn’t help blend the eyeshadow all that well. These are really the only issues with the palette, these alone wouldn’t put you off because the shades are so pigmented. All in all, this palette is very much affordable for anyone. It has nice shades that would suit anyone who wants either a dark matte shade matched with a bright metallic shade or a light matte colour blended with a bit of dark. It is perfect for all occasions and would rival the Urban Decay Naked Palettes any day.